The company was based on a small iron and screw business in London that had been purchased by John Sutton Nettlefold which he rapidly developed . 1849 Frederick Nettlefold (1833-1913), son of John Sutton Nettlefold, joined the business . The business was converted into a limited company Nettlefold and Son. 1851 At the Great Exhibition of 1851 at the Crystal Palace, John Sutton Nettlefold saw a machine for the automated manufacture of wood screws which had been invented by an American . He negotiated to buy the British rights to the patent, giving him the opportunity to dominate the domestic market. His brother-in-law, Joseph Chamberlain (1796-1874), invested £10,000 (and more later) in the business to help with the cost of the patent, the machinery and a factory at Smethwick. However, the 1851 story is discounted in the official GKN history. This says that the US stands at the Great Exhibition did not contain any machinery for making screws, but speculates that Nettlefold may have met Thomas J. Sloane there, or at least someone who knew of him or of his invention. 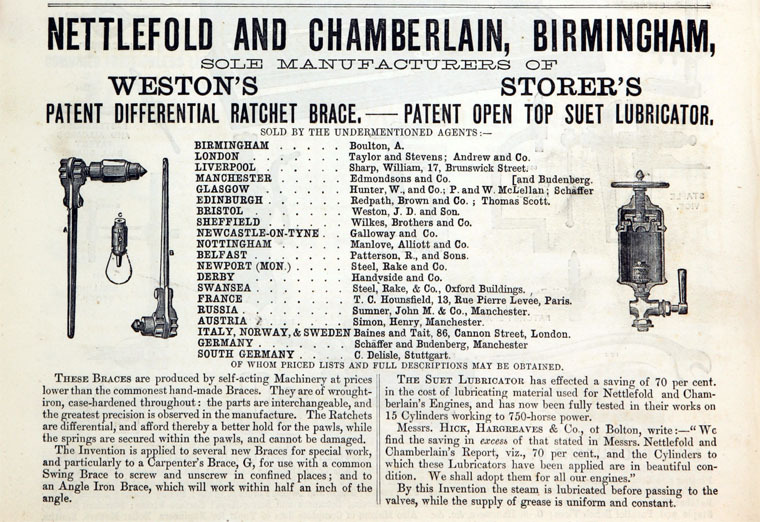 Nettlefold and Chamberlain bought the British rights to Sloane's patent for the manufacture by machinery of woodscrews with gimlet points in 1854. 1854 Chamberlain sent his eldest son Joseph Chamberlain to join the business in Birmingham to look after his investment. A partnership was established Nettlefold and Chamberlain with the two Nettlefolds and the two Chamberlains sharing responsibilities in the business . The younger Joseph Chamberlain took on the accounting, in which area he introduced many innovations, and later the marketing of the products; his cousin Joseph Henry Nettlefold  took care of production. The business expanded overseas, forming agreements with other manufacturers about division of the markets. From about 1869 Chamberlain took more interest in politics. 1866 John Sutton Nettlefold died . 1868 Edward Steer, nephew of John Sutton Nettlefold the founder of the firm, joined the business . 1871 The Castle Iron Works was opened in Hadley, Shropshire, soon manufacturing wire and 400-500 tons of bar iron each week, an early example of Nettlefolds' vertical integration of the business which was to continue for a long time. 1874 In June, Joseph Chamberlain left the business to concentrate on politics. 1874 After the Chamberlains left the firm, the partnership Nettlefold and Chamberlain was dissolved and the business continued as a limited company. 1876 Machine for producing screws. The works had 2,000 machines producing half a million screws per week. (Exhibit at Birmingham Thinktank museum). 1876 At this time the company also traded under the names of Imperial Wire Co and the Castle Iron Co.
1878 Edward died leaving effective control of Birmingham manufacturing and engineering to Joseph, and his younger brother Frederick Nettlefold in London. 1880 Nettlefolds was launched as a limited company. The Nettlefold brothers went on to reinforce their dominant position in the British wood-screw market through many mergers and acquisitions, eventually becoming part of Guest, Keen and Nettlefolds. 1881 Joseph Henry Nettlefold died. Frederick Nettlefold remained as chairman. 1893 Frederick Nettlefold retired from the chairmanship of the company . 1905 The partnership between F. Nettlefold, A. Steer and O. Nettlefold "under the style of Nettlefold and Sons, High Holborn, W.C.", was dissolved . This presumably means that the shop in London was kept out of the Limited company when it was formed. This page was last edited on 30 June 2018, at 18:21.